As I said, I typically make my meals on the weekends and munch on leftovers during the week. One perk, especially for me, is that my photographs benefit from the daylight. Sometimes, though, I may take a photo of a meal prematurely.. before I have it nailed down. This recipe is all about the sauce. A mojo sauce. A creamy, yet light and zippy sauce filled with roasted red peppers, cumin, almonds and cilantro. Inspired by Sarah at My New Roots, I used less oil but otherwise true to her recipe. Reminiscent of my favourite Chickpeas Romesco, I originally ate this smothered over chickpeas with a lettuce base. After an overnight marinade, it was nice. Except I didn’t think it worked that well with the lettuce (sorry, lettuce greens!). 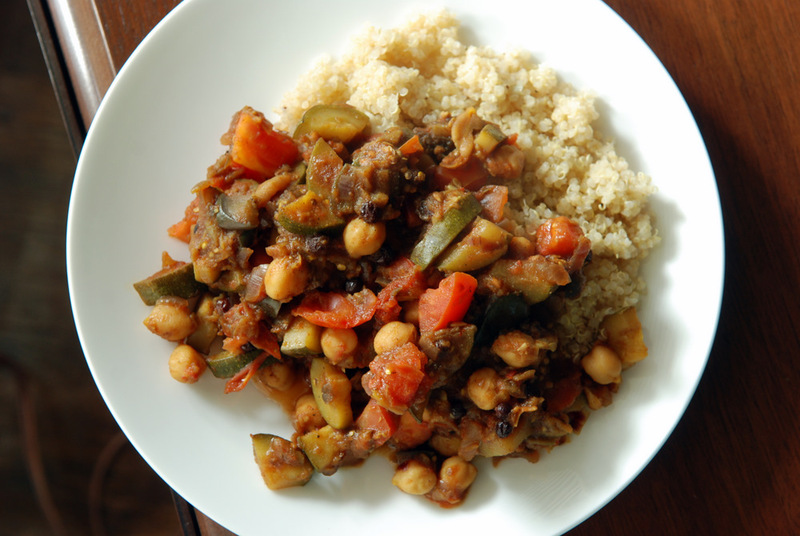 I used half of the sauce for two cups of chickpeas, but mid-week I became creative (sadly, without a camera). It just goes to show you how diverse this wickedly addictive the sauce was… because it was devoured in no time. I enjoyed it unadorned with crackers and raw veggies as well as smeared overtop some veggie burgers (recipe to come!). 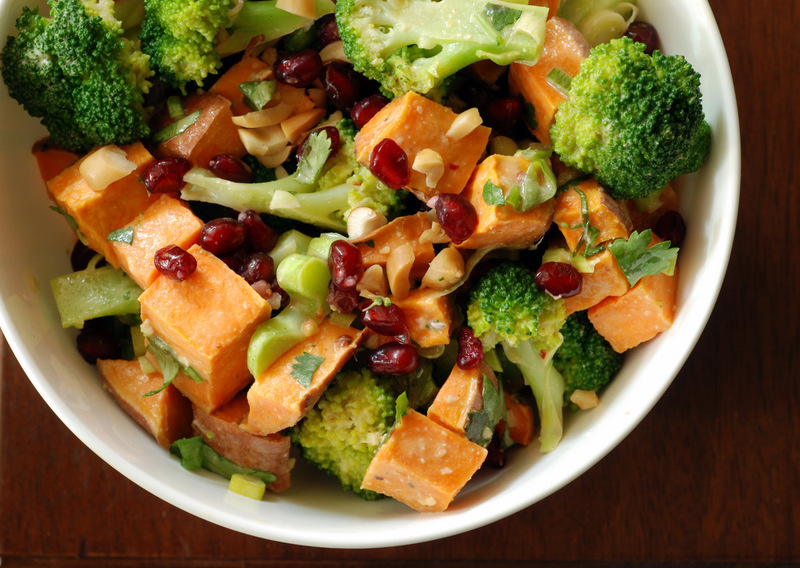 This is a superfood salad if I ever saw one. Pomegranate seeds. Sweet potatoes. Broccoli. 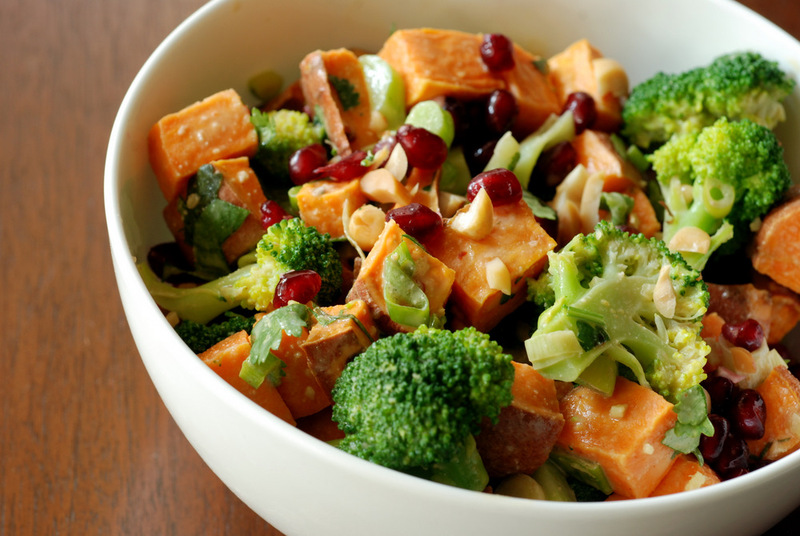 All together in a peanut dressing. 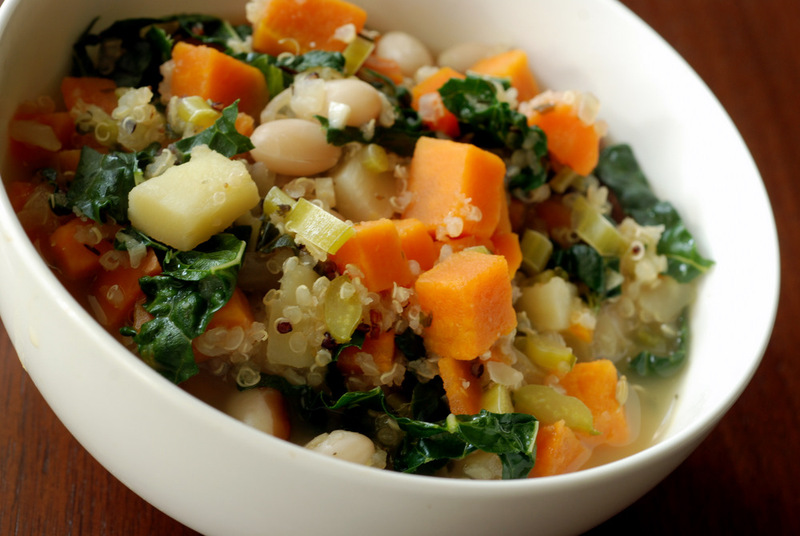 Even though it doesn’t have kale, many of these veggies top my superfood chart. I took inspiration from a recipe in 1000 Vegan Recipes where I increased the veggies in the salad and seriously increased the pomegranate seeds. If you don’t have pomegranate, dried cranberries could be a reasonable substitute. While I typically prefer acidic dressings, I kept the peanut butter in the dressing but substituted vegetable broth for the oil. 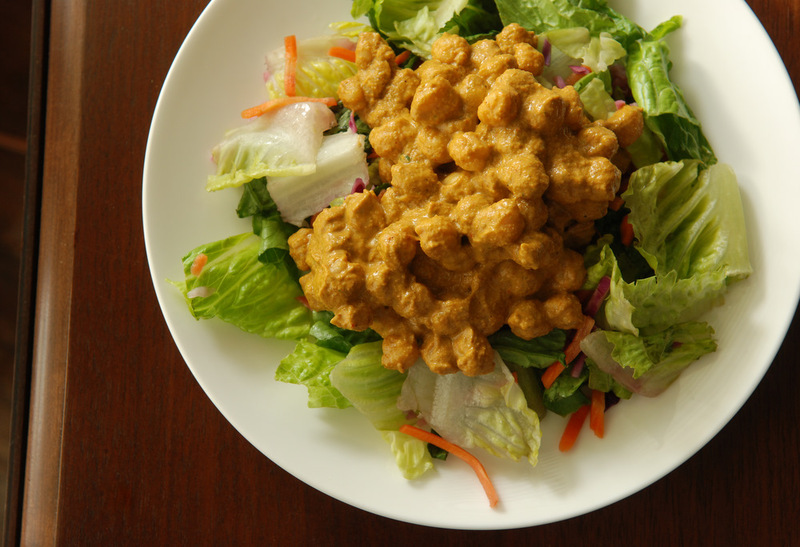 This allows the peanut flavour to permeate the salad without dripping in dressing. In fact, the peanut flavour wasn’t that dominant, sitting back to highlight the natural flavours of the vegetables. 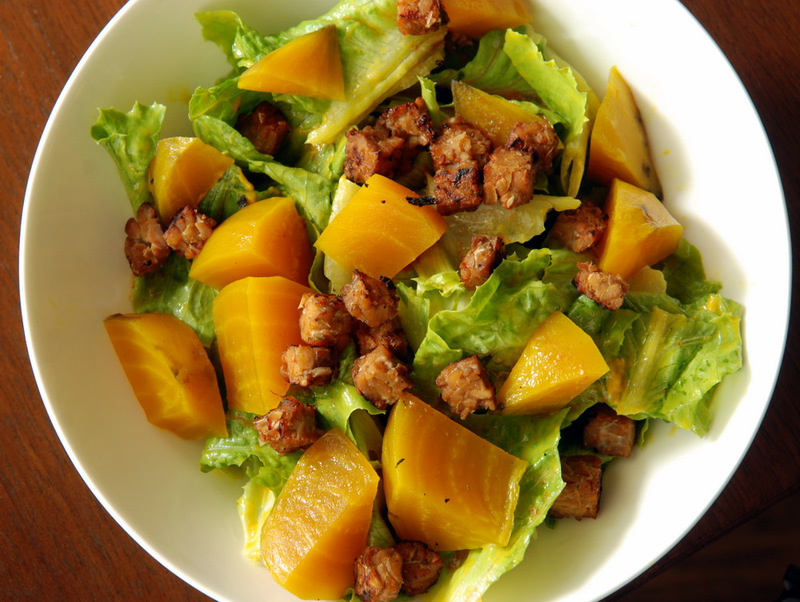 Next time, I might try this with a pomegranate-infused vinaigrette as a dressing, too. This is my submission to Deb for this week’s Souper Sundays and to Ricki’s Wellness Weekend. ‘Tis the season for kale. I went to the St Lawrence Market this weekend to buy some kale. I was pining the HUGE $2 bundles of kale. Last year, with only one bundle I made Brazilian Potato-Kale Soup with Sizzling Chorizo (Caldo Verde), Vanilla Sweet Potato and Kale Curry, African Pineapple Kale Peanut Stew AND Cranberry Bean Mole with Roasted Butternut Squash. The bundles were that huge. This week, they had smaller bundles, all from the top part of the plants. Still a great deal at $1.50 and actually more manageable to eat in a week. I bought 2 bundles because I planned for a kale chip marathon this weekend. While I also scored a delicata and kabocha squash (I have yet to try them but I hear they are wonderful), I wasn’t able to find celery root (aka celeriac) which was my main reason for visiting the market. I guess, I will have to head back next week. While I feel like the winter heralds the end of fresh vegetables (my local farmer’s market has already closed for the season), without physical snow, there is still lots of food from local sources. In fact, I still have kale growing in my own garden! It became much more prolific since the first frost. 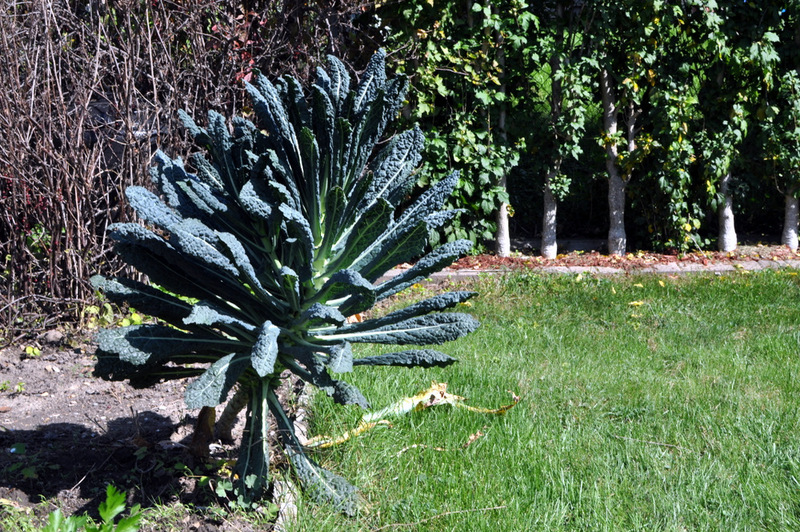 The winner of the kale plants we planted this year was the Vates Blue Curled Kale. It is a dwarf plant, so the plants are smaller and don’t take as long to grow (dinosaur kale takes 90 days to grow, whereas these need only 30 days). 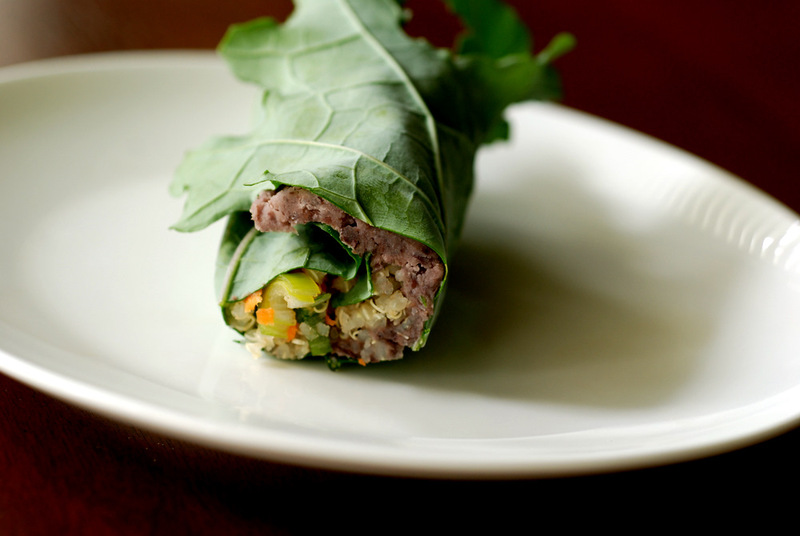 The leaves are smaller and more tender, thus they are perfect for wraps. No need to steam, because they taste wicked awesome fresh from the garden. 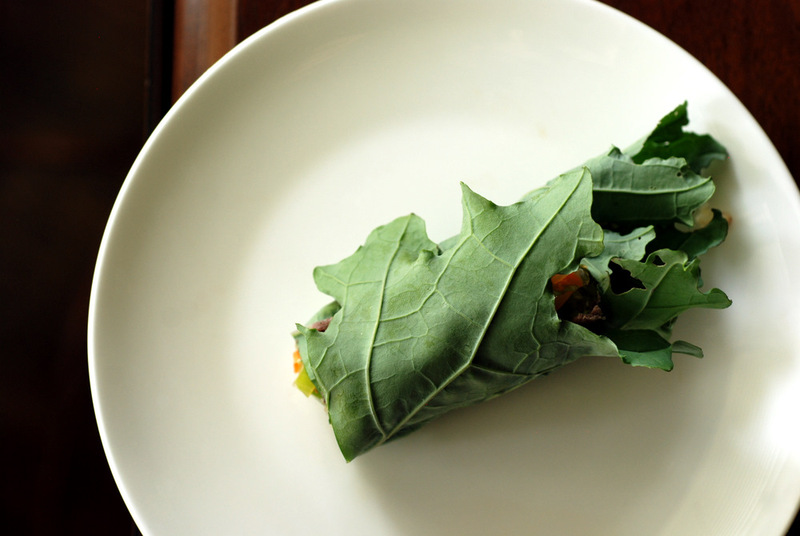 This is a delicious wrap that I adapted from The Two-Week Wellness Solution. Tess initially made these as tostadas, but I really enjoyed these as wraps. I pretty much adore all of Tess’ recipes and had bookmarked these for the longest time due to their positively glowing reviews. Then Ashley posted her version, and I knew I had to try it. It looks so daunting with all the ingredients, but it is actually really easy to make. 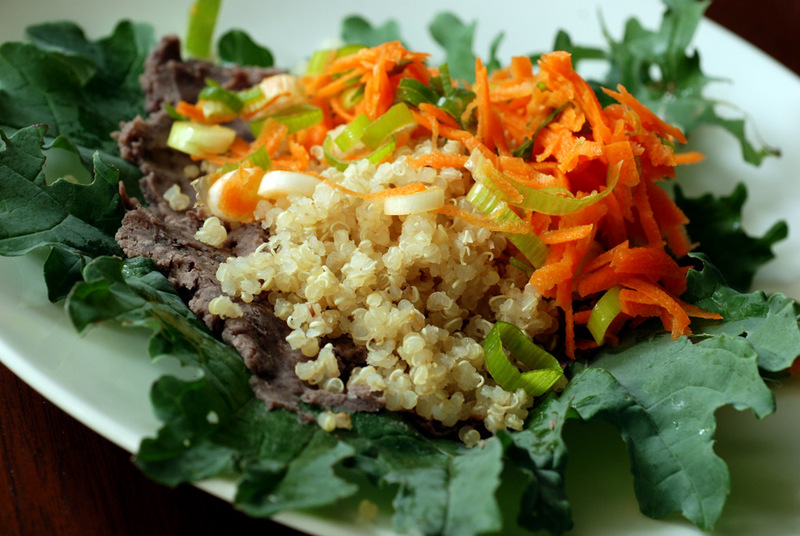 The mashed black beans seasoned with lime, cumin and onion are the star of the wrap, contrasting nicely with quinoa as well as lime-spiked carrots and green onions. The avocado adds a creamy touch. Try it as a tostada, or a wrap, but any way will be delicious. This has been one of my favourite meals. Enjoy! This is my submission to this month’s Bookmarked Recipes, this month’s Simple and in Season and this week’s Weekend Wellness. Let’s turn your bowl upside down. Grain bowls are easy to make. Pick a grain, slather with some dressing and top with your favourite veggies, nuts and seeds. Try to pick a theme: like this sushi bowl with brown rice, topped with asparagus, avocado and toasted nori sheets. Or my millet bowl, topped with cooked spinach, leek and toasted pumpkin seeds. 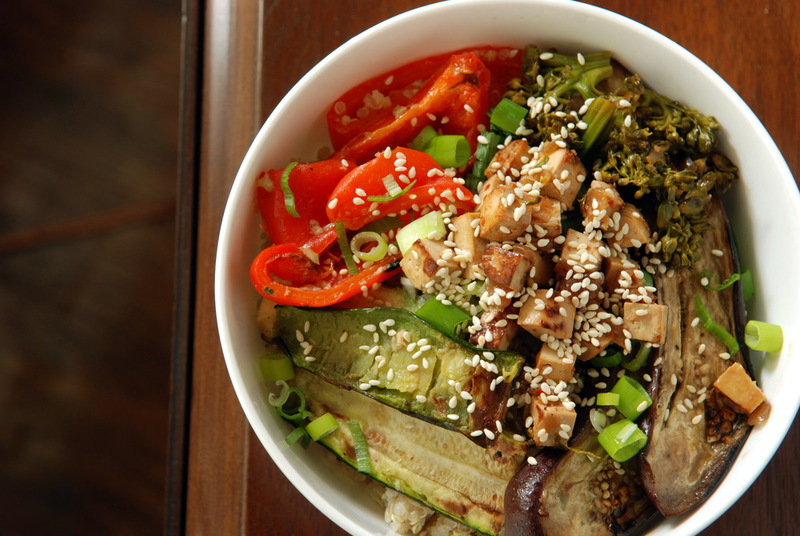 Or my more recent Dragon quinoa bowl, topped with roasted veggies in a miso gravy. 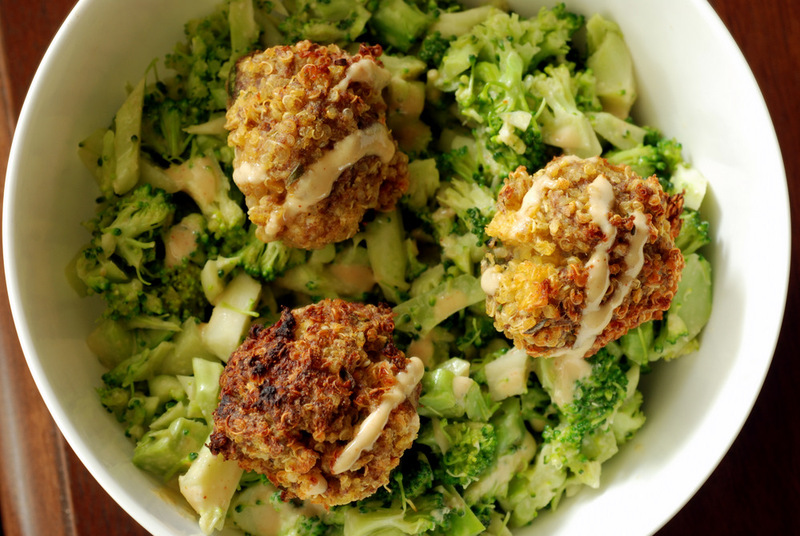 This time, I wanted Middle Eastern flavours and picked a broccoli salad as the base and topped it with baked quinoa falafels, finished with a drizzle of a tahini-miso sauce! 1) Broccoli Base. I prefer lightly steamed broccoli, so I steamed large florets for a short period of time. I cut them into small pieces after they had cooled. 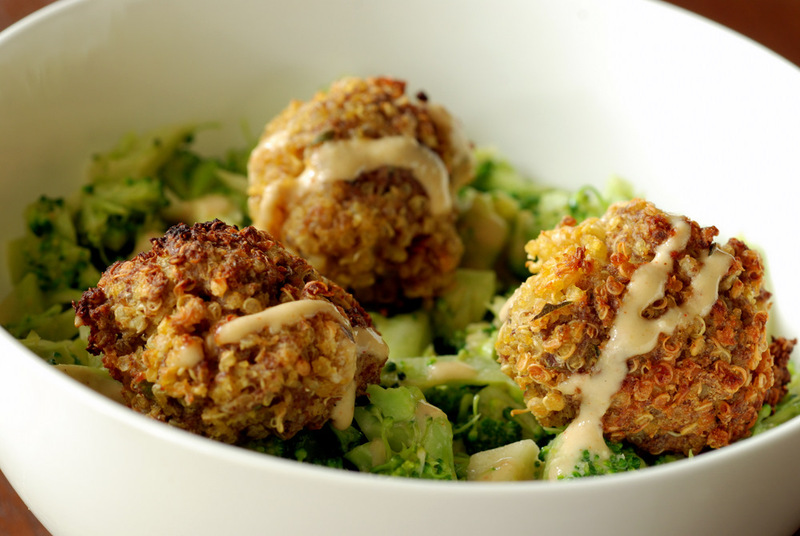 2) Quinoa Falafel from Whole Foods to Thrive. These were definitely the star of the bowl. These baked falafels are made with cooked quinoa and flax and spiced with miso, tahini, nutritional yeast, onion, garlic and oregano. After broiling them, they are nice and crispy on the outside and chewy, yet soft and creamy on the inside, loaded with tons of flavours. I don’t like greasy, dense falafels, so these nuggets were perfect for me. 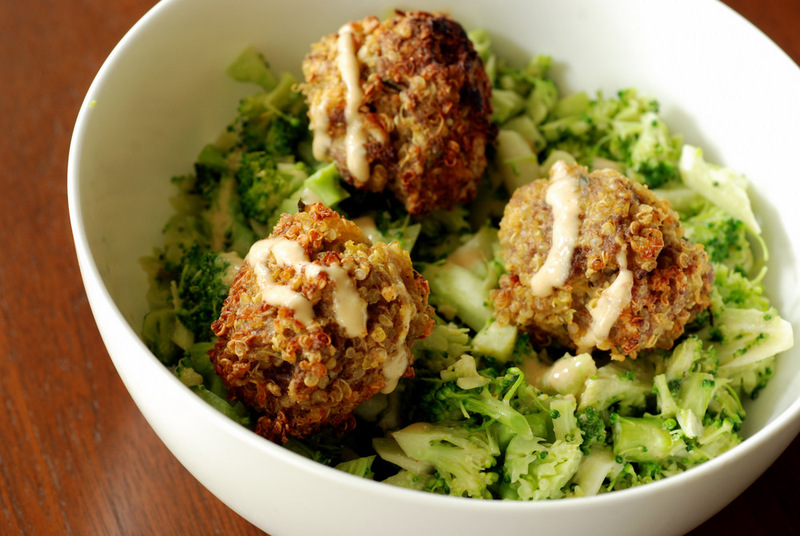 3) Tahini-Miso Sauce from the Cheesy Broccoli Bowl from Whole Foods to Thrive. 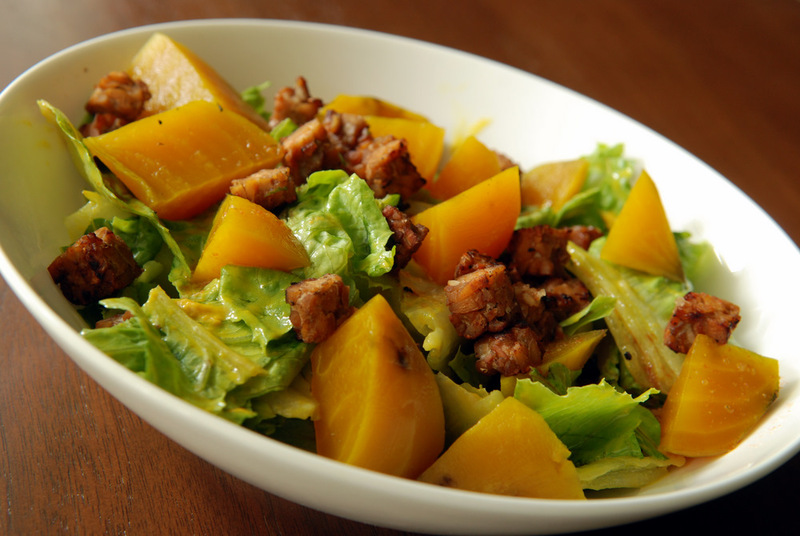 The dressing for this salad is addictive, although I wouldn’t call it cheezy. It has a more pronounced tahini-miso flavour but still delicious. I opted to toss half the dressing with the broccoli and reserved half for the falafel. I preferred the dressing when I could taste it in large amounts, so next time I may not even dress the broccoli and simply drizzle it overtop prior to serving. This is being submitted to this week’s Weekend Herb Blogging, hosted by Brii from Briiblog. I have become hard to please at restaurants. I’ve already lambasted Fresh for their limpy soba noodles and hit-or-miss salads, but now that I am armed with their miso gravy, I can conquer the world! Or at least make sure their recipes are a hit when I make it myself. 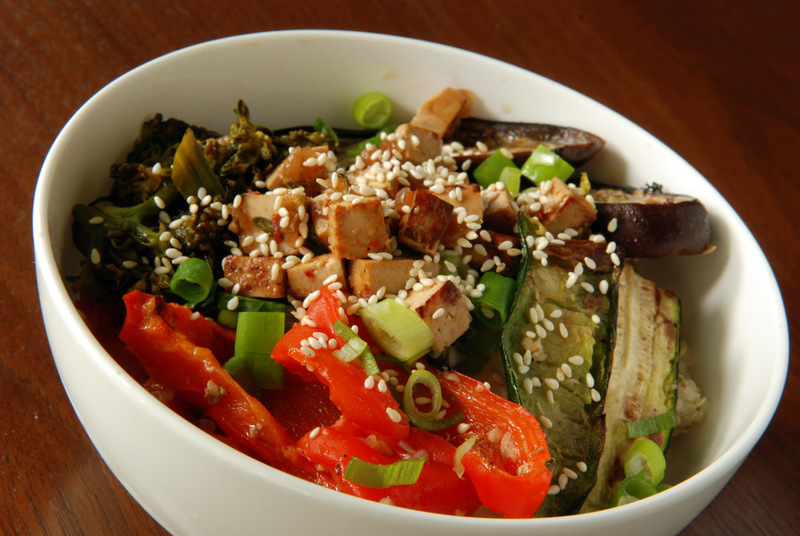 On their menu is their Dragon Bowl: brown rice or soba noodles topped by grilled tomato, zucchini & tofu steaks with rich miso gravy, sesame seeds, cilantro & green onions. But now I can make Fresh’s Dragon Bowl, My Way. Forget the brown rice, or their gummy soba noodles, I want my grilled vegetables overtop quinoa! 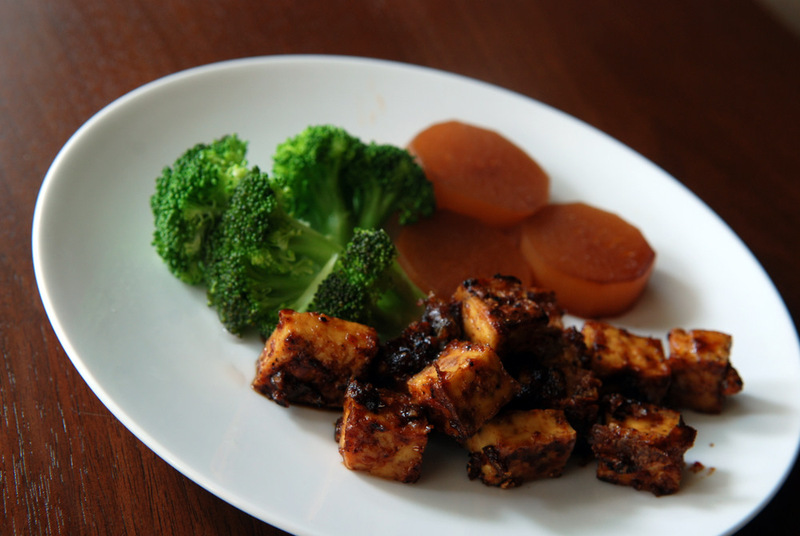 Marinate some tofu in soy sauce and sesame oil and pan-fry it to perfection. Pick your favourite vegetables (zucchini, bell pepper, eggplant and broccoli are what I had on hand), douse them in a bit of olive oil and chopped garlic, grill them on your barbecue (or broil in your oven), smother in miso gravy and then sprinkle sesame seeds and green onions overtop. This miso gravy makes everything taste great! Why this is called a dragon bowl, I have no clue. All I know it tastes great. This is my submission to this month’s Simple and in Season and to this week’s Weekend Wellness. I bet most people think of tofu and veggies. Replace your typical meat with tofu and you’re vegan, right? Not in my kitchen! I don’t cook with tofu that often, and if I do, it is usually incorporated into my meal. I’ve made a few stand-alone tofu recipes, and that was even before I went vegan. Figures! So here I go, with something that seems so traditional old-school vegan. Delicious Tofu. Matthew’s Delicious Tofu. Who is Matthew? I don’t know.. but he likes tofu! 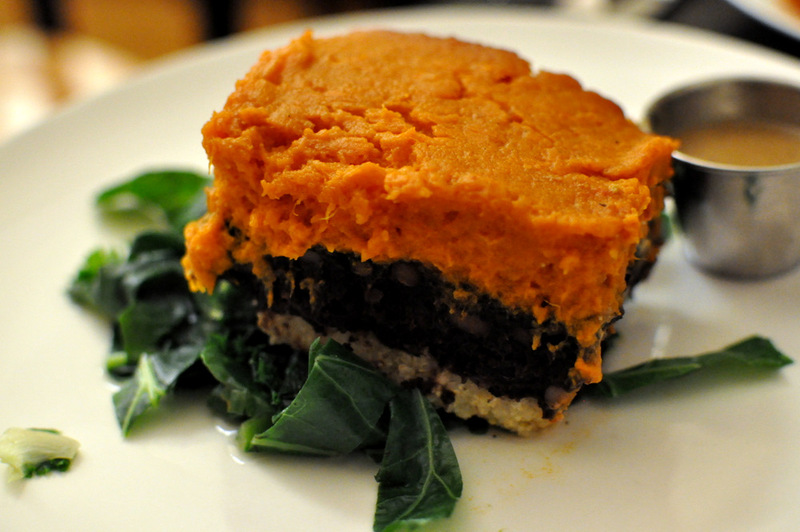 This recipe is pretty old school, because Ashley posted the recipe in 2007, from The Garden of Vegan published in 2002! She kept mentioning it as one of her favourite tofu dishes, so I had bookmarked it a few times. When I made the braised daikon, I knew I needed a protein source and serendipitously decided to finally make Matthew’s Delicious Tofu. I didn’t really know what to expect, other than some delicious tofu. Turns out this is an awesome sweet and sour, hot and spicy fried tofu dish with just the right amount of spice from the garlic and ginger. Maple syrup, soy sauce and lemon juice create the succulent sauce. This was deceivingly addictive. No, really. I had to stop myself from eating the whole thing. The tofu had great texture and the sauce was marvelous. I served it with a simple side of steamed broccoli and the braised daikon. I thought about making more sauce to go overtop the broccoli, but I liked the contrast of the sweet and zippy tofu with the plain broccoli. It may have been sauce overload otherwise. If you compare meat and vegetables, which are more expensive? Meat, right? I hear people complaining how costly fresh vegetables are, but really it isn’t that bad. The problem is that they are perishable and don’t necessarily keep that long. I suppose the same is true with meat, but it can easily be frozen without adverse effects. Now tell me what the cheapest vegetable is…. Carrots: $1 for 4 lb is pretty good. 25c/lb. I’ve bought a head of cabbage for 50c. That’s like 20c/lb. Kohlrabi is cheap, too. I’ve bought it on sale for 19c/lb at Sunny’s. Probably because no one has a clue what to do with it. When I see butternut squash on sale for 19c/lb, I stock up! But no, I’ve seen fresh veggies even cheaper than 19c/lb. Daikon is also known as a white radish and is relatively mild but still has a peppery punch. While I have cooked with daikon in my Japanese Winter Stew, I don’t have that many daikon recipes. I couldn’t help myself, though, and grabbed a handful of daikon for the road. As a root vegetable, they keep extremely well in the refrigerator. A quick search led me to Miss Figgy’s daikon braised in mirin and tamari, which she adapted from The Kind Diet (original recipe posted here). 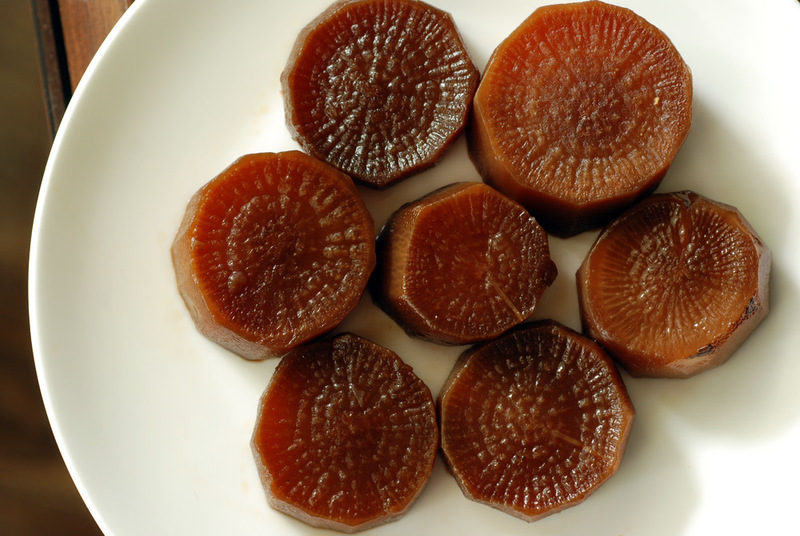 The long braise was supposed to turn the normally pungent white radish into sea scallops. Not that I really know what sea scallops taste like, but I can imagine the texture. Let me tell you, I would not have even guessed this was daikon. 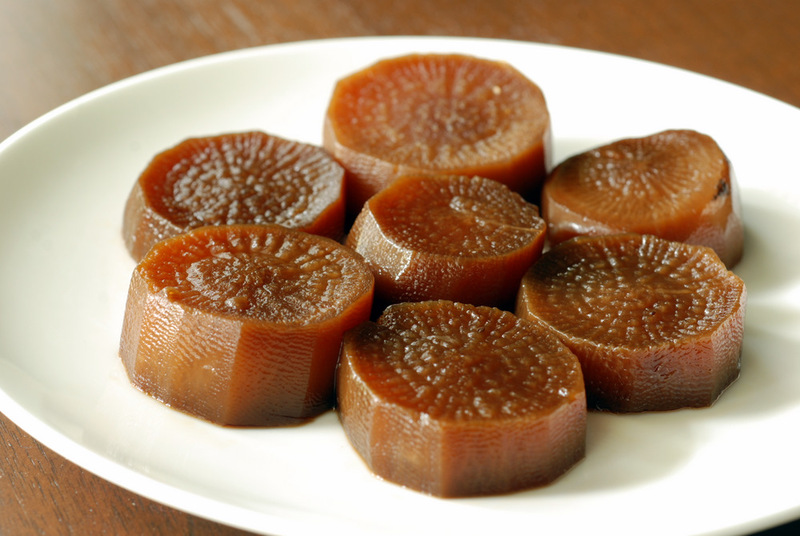 After the long braise in mirin, tamari and kombu, you create a subtly sweet and salty treat. There was no trace of spicy radish here. The radish was just a vehicle for the sauce. These are great warm, fresh from their long braise, but also chilled as leftovers. This is being submitted to this week’s Weekend Herb Blogging, hosted by Christina from La Cucina di Cristina. 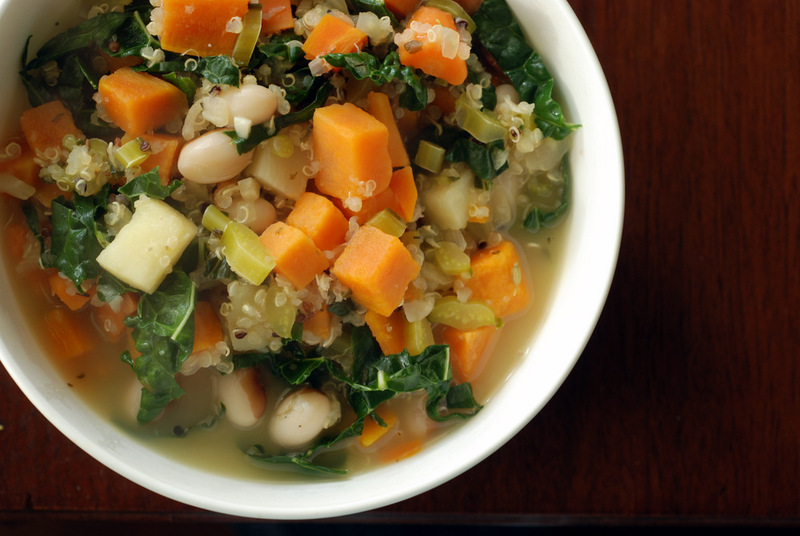 Be prepared for some serious veggies this month. Last month was beans. This month will feature loads of greens. A spotlight on the various ways of eating delicious cruciferous vegetables, which include veggies as seemingly varied as kale, broccoli, cauliflower, cabbage, and daikon (white radish). Each one loaded with vitamins and many of them top my superfood chart. Trust me, they do not need to be boring. Anything but! Here we go, case in point here. A party in my mouth. Brazilian food tends to do that for me. Just like Moroccan food, Brazilian cuisine is known to be meat-heavy. However, there are endless recipes for delicious vegan alternatives. In my own kitchen, I can create quite the flavour fiesta. 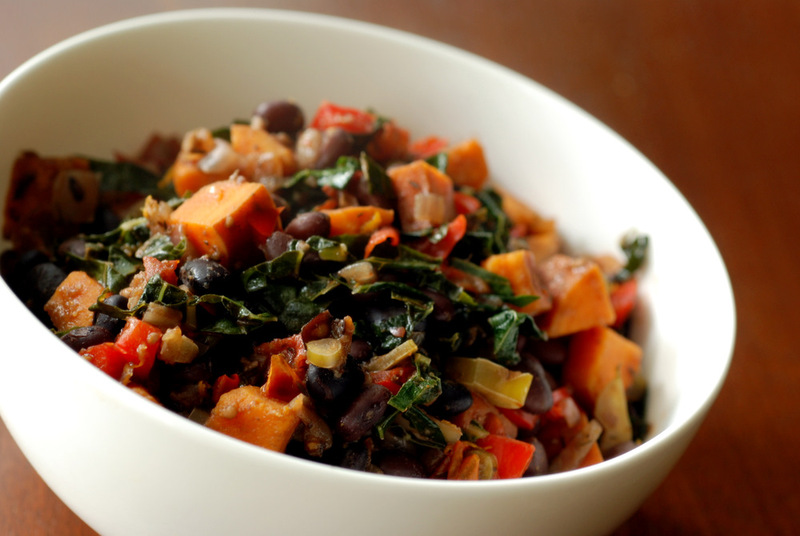 While selecting a random recipe for this month’s No Croutons Required, I was thrilled when this Brazilian Black Bean and Vegetable Stew from The Tropical Vegan Kitchen was an option. It marries two other dishes I have made: a hearty feijoada with black beans and mushrooms as well as a a black bean soup spiced with cinnamon and mango. The results could not have been better – both in the flavour department and in the colour department! 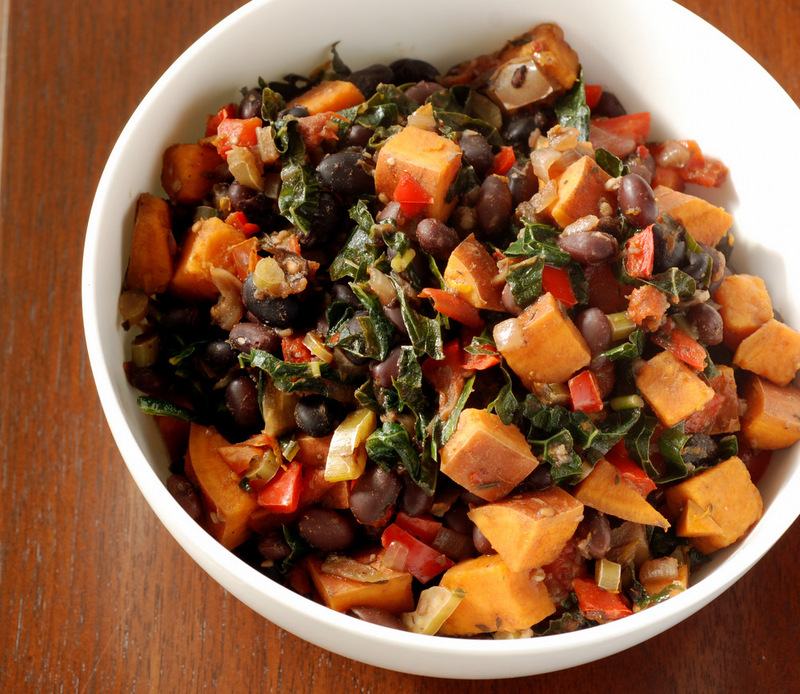 This stew is filled to the max with colourful veggies (sweet potato, red pepper, green pepper, tomato, kale) on a background of black beans. Garlic, cumin and thyme flavour the broth. While I cooked the stew, it was also spiced with orange zest. I was worried it would be overpowering. It wasn’t until I added the final hit of lime juice that I was seriously satisfied with my beautiful and delicious stew. This is my submission to this month’s Simple and in Season, to this month’s Sweet Heat featuring chilis in soups, to Ricki’s Wellness Weekends, to Deb for this week’s Souper Sundays and to this month’s No Croutons Required (co-hosted by Jacqui and Dom) featuring random cookbook recipes. There is always something fun going on in our kitchen…. As Rob likes to say, if something hasn’t been dropped while he’s cooked, then he hasn’t really cooked. My nemesis in the kitchen is having my water boil over while I make steel-cut oats. I swear, it happens nearly every week. Mostly because after I get my oats simmering, I usually wander away to do other things… load/unload the dishwasher, get dressed, etc… and then I hear sputtering and I’m back in an instant to calm the oats. I am pretty good about not burning things, though. So, when I roasted some eggplants over the gas flame on the oven, Rob was alarmed when he smelled smoke from his upstairs office. Everything alright? he asked. He peered at my neat pile of 7 Asian eggplants, on fire on the stovetop. 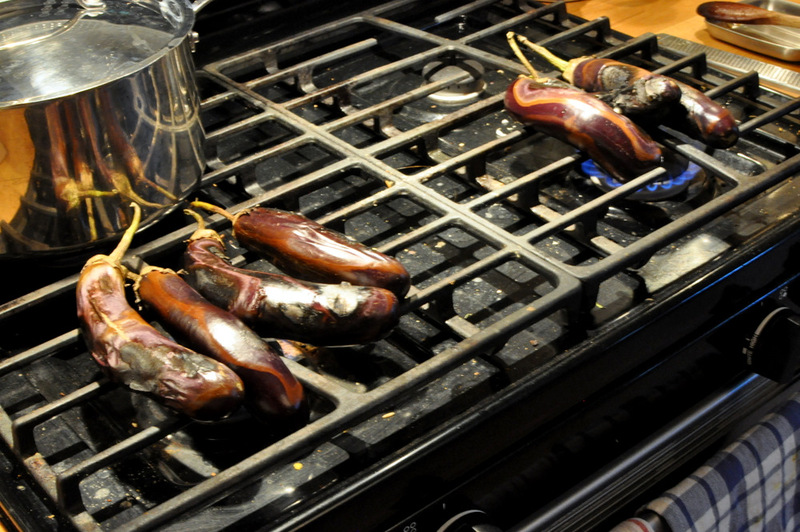 I am roasting eggplants! They are supposed to turn catch on fire and turn black. Honestly! This fire is under control! While in Turkey, I learned how to roast an eggplant to get that smokey flavour for the eggplant in Sultan’s delight. You need to do it over an open flame. Apparently the big fat eggplants here have a much tougher skin, so they suggested getting an Asian or European variety with a thinner skin. After you have charred the eggplant, carefully remove the skin while retaining all the juice. The smaller eggplants, though, turn this into a very tedious chore. But, yes, it was worth the efforts. You can’t duplicate that flavour without the fire. 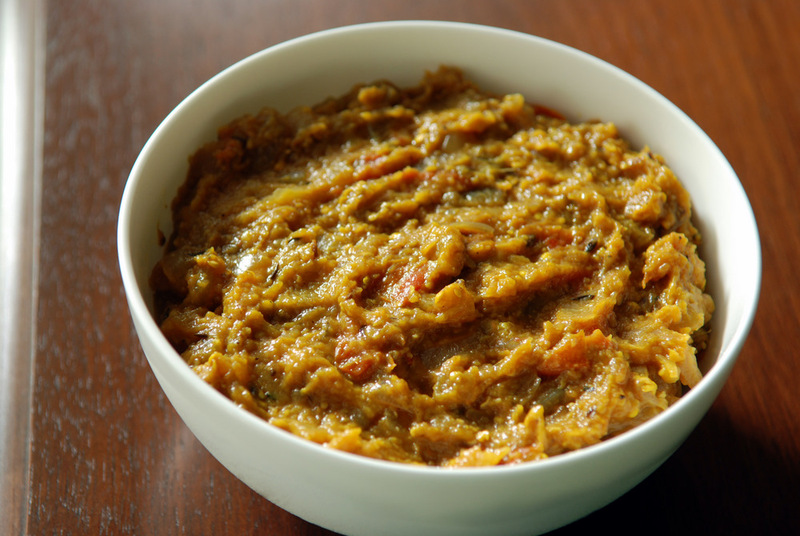 I have been meaning to make the Indian roasted eggplant dish, Baingan Bharta, for the longest time. However, as it is vegetable-based side dish, I have found it harder to incorporate into my weekly meals. I don’t usually do the two-dish dinners. So when I spotted this Eggplant and Lentil Curry at The Kathmanduo, I knew I had a great combination. 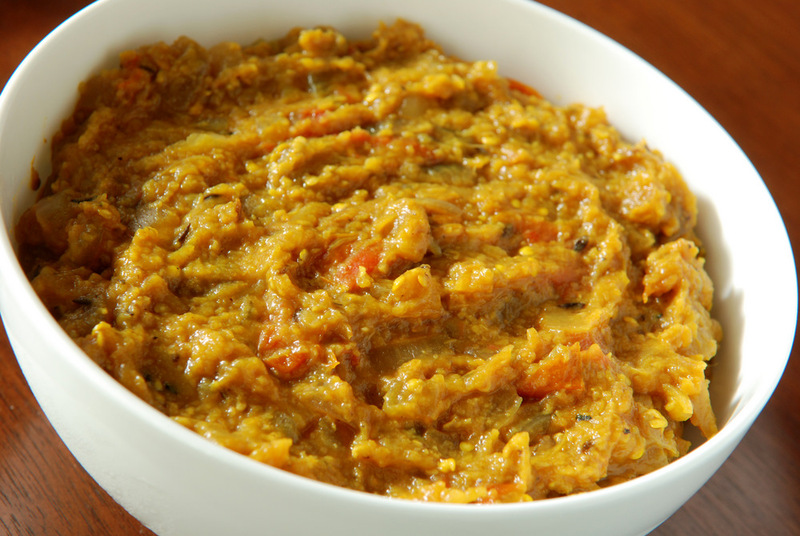 Essentially, you are combining dal bhat (or just dal since there is no rice) with baingan bharta. The dal, alone, was superb. 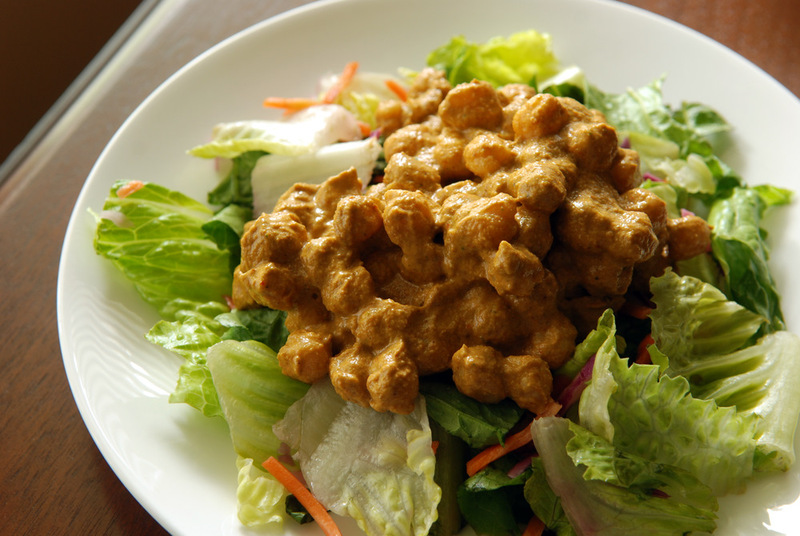 The fenugreek adds a more savoury note that is tempered by the typical Indian culprits of cumin, ginger and coriander. You could stop right there, throw in some rice and have an excellent meal. With the roasted eggplant, you create a smokey, sultry savoury mush. It wasn’t what I was expecting from a bharta, as I wanted something with more tomato presence. The smokiness from the eggplant was unbeatable, though. Now throw it into your dal. Mix the two together. Bliss, sheer bliss. And a complete meal: veggies and beans. Add your favourite grain if you are still so inclined. Sadly, as much as I adored this dish, this will be the last time I will be able to roast anything on an open flame in the kitchen. This is being submitted to Lisa’s Celebration of Indian Food, to Ricki’s Wellness Weekends and to this month’s My Legume Love Affair, hosted by Simona. I know I’ve briefly mentioned it before, but I tend to do the majority of my cooking on the weekends and eat leftovers all week. 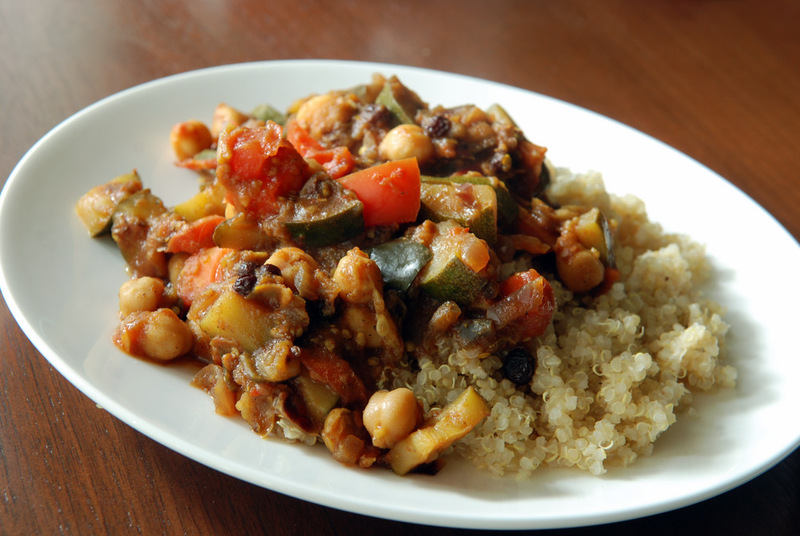 Vegan cuisine, especially soups, curries and bean salads, lend well to leftovers because they only taste better after they have marinaded. Sometimes I crave a nice, fresh hot meal, too. It can be difficult to make a complete meal if you are famished after a long day at work…. unless, you have the forethought of making all the components ahead of time! I found this delicious salad at Post Punk Kitchen. I know it looks like another crazy multi–component salad: roasted beets, smoky tempeh croutons, a warm maple mustard dressing. Trust me, the best dishes get you to bring out the best of each component. Work on the weekend for each component, then bring it all together mid-week. First, you need to roast your beets. Glorious roasted golden beets. Next, steam your tempeh, then get it marinading. Tempeh has a bad leftover track-record, which is why I planned on making this salad fresh during the week. I left the tempeh in the marinade until I took out a portion to freshly panfry for the salad. For my last salad, the tempeh had been marinading for 5 days. The maple mustard dressing is a snap to put together as well. So, when you come home from work, and it is late, and you don’t want to think, now you have all the components for a wonderful salad. 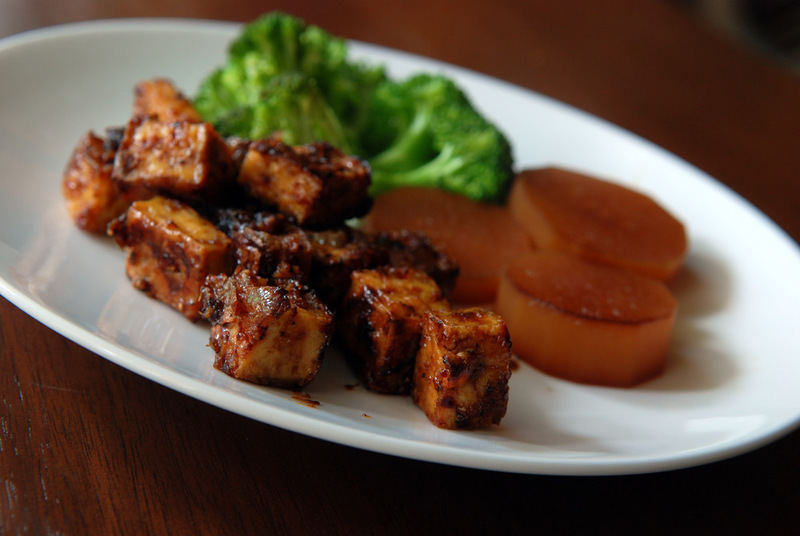 Take out your nonstick frypan and fry your tempeh. Meanwhile, get out your beets. Toss them into the frypan with the tempeh if you’d like (or not). Pull out your greens and get chopping. Using Swiss chard or kale instead of Romaine? Finely chop the stems and throw it in with the tempeh, too (or not). Warm the dressing in the microwave (or not). Add to your leafy greens. Add your beets if they aren’t in your frypan. By this time, the tempeh should be almost done…. when it is, plop it on top of your greens. Ten minutes, tops. I promise. This is my submission to Deb for this week’s Souper Sundays and to Ricki’s Wellness Weekends. Can I still call this Tunisian if I didn’t use harissa? I had all intentions of making this with my home-made harissa, but when I found it again in my fridge, it had grown some mold. I guess I was a bit skimpy on the oil used to cover it? Who knows… I will have to investigate another way of saving it. Perhaps in the freezer, frozen in ice cubs trays like I save pesto? I didn’t have time to make more harissa, so I substituted my Aleppo chili flakes instead. 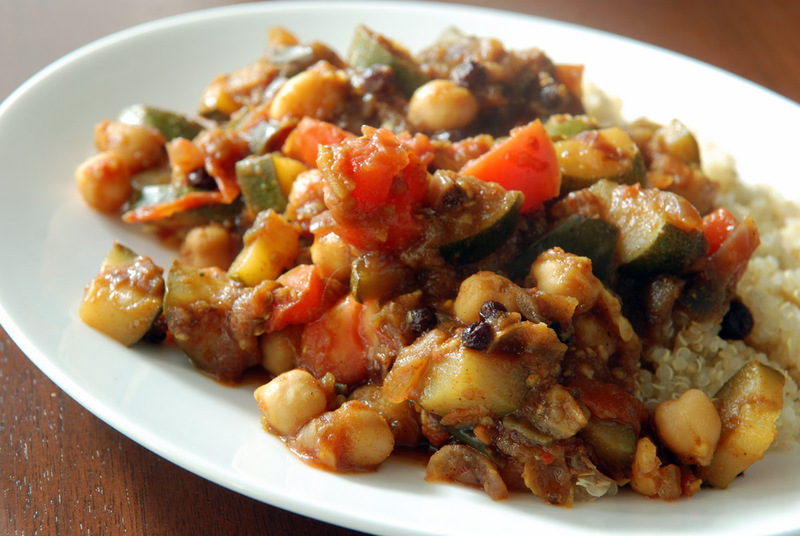 I was drawn to Susan’s recipe at Fat Free Vegan when I saw a nice medley of end-of-summer vegetables (zucchini, tomato and eggplant) with chickpeas simmered in a flavourful sauce including smoked paprika, allspice, cumin and cinnamon.. and (the missing) harissa. I prefer currants to raisins (texture issues, mainly) and they still added a subtle sweetness to this lovely vegetable ragout. I initially served it with the garlicky quinoa, but later gravitated to serving it overtop chopped Romaine leaves, turning it into a delicious salad. It worked surprisingly well! While I have posted a few eggplant dishes, I have never microwaved it like I did here. It was a neat way to partially cook it without any oil. It also didn’t have any of the bitter aftertaste people can complain about. When it was combined with all the other veggies in the delicious sauce, you almost didn’t even know it was there. This is being submitted to this week’s Weekend Herb Blogging, hosted by Anh from A Food Lover’s Journey and to My Kitchen, My World for Tunisia. This is the story of the kale I never had. We had lofty garden plans. We can grow herbs and hot peppers very well, but some of the veggies never materialized. Some just died like the zucchini, cucumber and rhubarb. I harvested some Swiss chard but not enough to make a whole salad. And the only thing I really wanted to grow from the garden was the kale. I planted different kinds of kale- dinosaur or lacinato, Red Russian, and Vates blue curled kale. The vates blue curled kale grew the best, but even then, it wasn’t much. A handful of leaves, tops. A HUGE lacinato kale plant (Rob took this photo AFTER I removed the bottom leaves for this salad)! 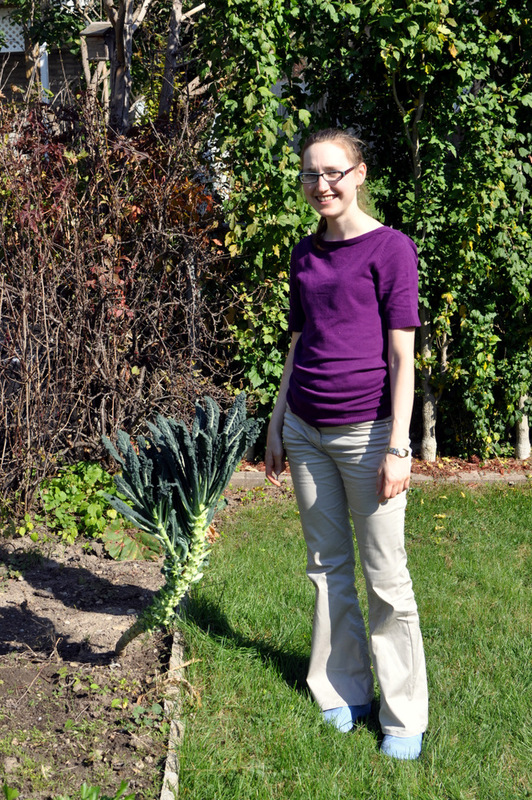 Rob’s Mom had to stop his Dad from cutting it down – they had saved the kale for me! 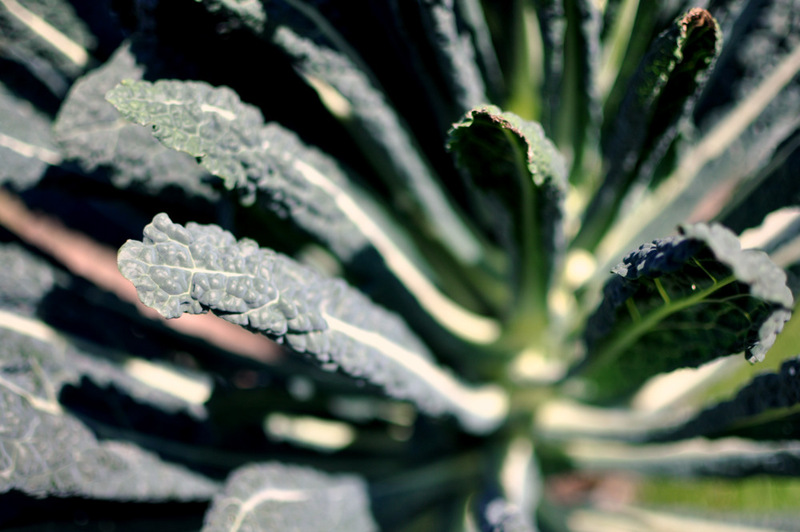 Lacinato or dinosaur kale is an heirloom variety of kale that is dark green with textured leaves. It is more tender and sweet than your standard curly kale, and works really well in salads. Armed with oodles of kale and a couple hours before the Thanksgiving feast, I quickly made myself at home in their kitchen and got to work making a salad. It sure is fun to cook in a well-stocked kitchen and garden! Lacinato leaves are more narrow, as well, but they can easily be removed with gentle traction (as seen in this video). I rolled all the leaves together and then cut them into thin slices, akin to a thick chiffonade. I grabbed some dill from their backyard and added it to a simple lemony vinaigrette, inspired by Ricki. Topped with grated carrots, julienned raw sweet potato and toasted pumpkin seeds, there was a nice orange visual with a serious satisfying crunch. The lemon-dill dressing complemented the salad without being overpowering. I will likely be known as the kale salad girl by Rob’s family. Two holidays, two raw kale salads. For Easter, I brought the raw kale salad with beets, raisins and almonds. 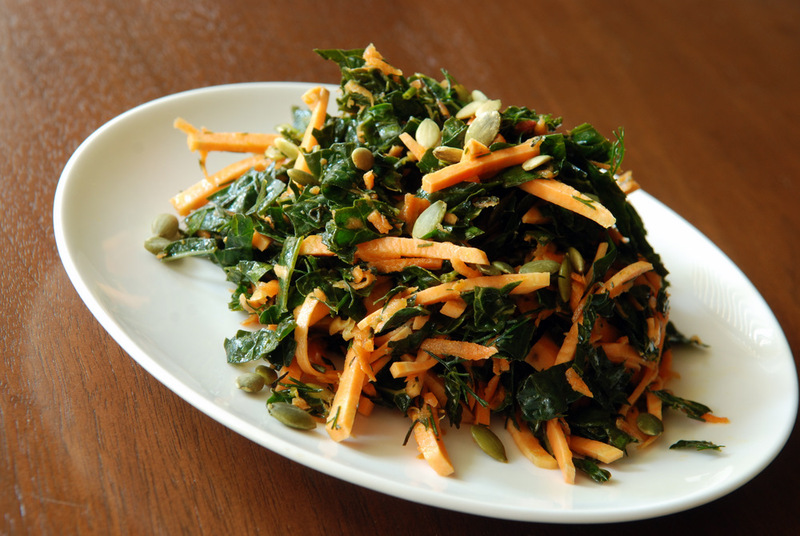 Thanksgiving, was this raw kale salad. Personally, I have no qualms sharing my joy of kale. They urged me to take home the rest of the kale. I didn’t want it to go to waste, so I left them the leaves at top so the plant would continue to grow. Kale apparently tastes better after the first frost, so I have hope there is still more kale to come! I finally broke out this casserole for Thanksgiving with Rob’s family. 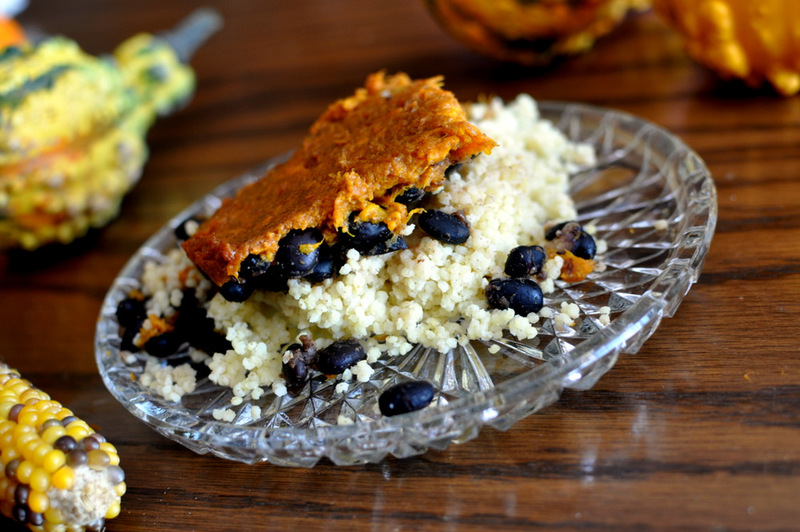 A multi-layered casserole: nutty millet at the bottom, with a middle layer of cumin-spiced black beans and onions, topped with a sweet potato mash flavoured with cinnamon and miso. Simple, familiar and homey. A complete meal. Perfect for a dish to share at Thanksgiving. Their recipe is misleading, so I will redirect you. You will notice that my casserole is a bit bottom-heavy. As written, 1.5 cups of dry millet is WAY TOO MUCH. I spread it out over an 7×7, a 9×9 and 2 smaller ramekins. As such, the rest of my toppings were too thin. I kept on wanting more of the sweet, sweet sweet potato mash. The miso and cinnamon really pumped up its flavour. Before I added the black beans, I thought they were a bit bland with only cumin, so I added a teaspoon of garam masala. For the beans, I wondered if a portion of the black beans should be mashed. This way if my layer of black beans was thicker, I wouldn’t have to worry about them falling all over the place. Looking back at the resto version, it looks like they have a trick for keeping that layer together as well. 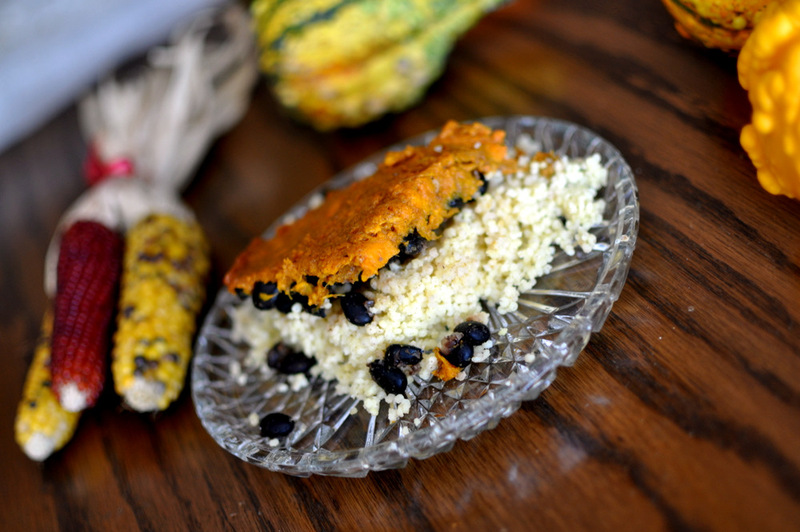 This is my submission to this month’s Bookmarked Recipes, Healing Foods featuring vegetarian Thanksgiving dishes, to Ricki’s Wellness Weekends, and to Cathy’s Healthy Thanksgiving Challenge.